The wonderful Hemerocallis. “Beauties of one day”, as by the Greek name. In fact the flowers of these plants blossom in the morning and last only 24 hours. 15.000 varieties for a very ancient flower with tetraploid shapes, in fashion now in the USA. Corollas often enormous. Easy to cultivate everywhere. Transient beauty, one day only beauty, this is the meaning of the name drawn from the Greek Heméra = Day, and Kallos = Beauty, but the Hemerocallis compensate this shortcoming with a very reach flowering, parading, like skilled jugglers, one after the other, corollas always fresh. Known, also, more prosaically, as Yellow Lilies, or Turkish Lilies, they distinguish from these close relatives for the segments of the perigone, joined at the base in a short tube, and for the organ receptive of the pollen, the sigma, which is not tri-lobed, but simple and roundish, similar to the head of a match. And then, furthermore, the Hemerocallis do not have the scaly bulbs of the lilies, but, like the Asphodelus, strange pulpy, engrossed roots, resembling to small sausages; spare organs, surely, for sheltering under the ground during the bad season, but structures quite different from the bulbs, tubers or rhizomes. Linnaeus, himself, was puzzled. In a first moment, he christened the genus as Liliasphodelus, as had already decided the French botanists of 1500, whilst the Germans were talking of Asphodelus liliaceus luteus, and the English, of Lilium non bulbosum, and then, not persuaded, exhumed the olg Greek name of Hemerocallis, used by Pedarius Dioscorides in the “De Materia Medica”, a ponderous treatise about the medicinal plants, where are praised the good qualities of these “beautiful for a sole day”, called, however, also “lemons”. Quaint, but understandable confusion, since some of these flowers have the fragrance of the citrus fruits, and are still used, in China, in the culinary art and in herbalism. From here, perhaps among the Macedonian armies suite, at least two species, the Hemerocallis flava, with yellow corollas perfumed of orange, and the Hemerocallis fulva, with odourless, yellow-orange flowers, had already reached Greece, before the Christian Era, and by the end of 1500, were familiar in all European gardens. A third species, the Hemerocallis minor, appeared suddenly, in 1759. It was blooming during the night, with an intense aroma of lemon, and had come to London on a vessel of the Company of Indies. In the following century, other species came from China, Siberia and Japan: less a dozen at all. 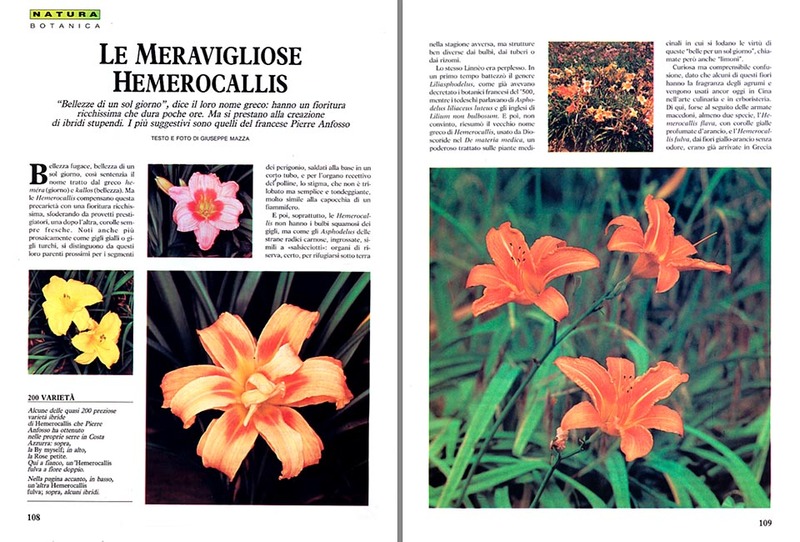 Cultivars came to life, but in Italy, after a short success at the time of our grandmothers, the Hemerocallis became out of fashion, leant against the walls like Cinderellas, and in the abandoned corners of the gardens. A long, incredible, “horticultural sleep”, lasted till a few years ago, whilst, starting from 1930, at the Botanical Orchard of New York, were coming into the world, following some genetic researches, the first modern spectacular hybrids. 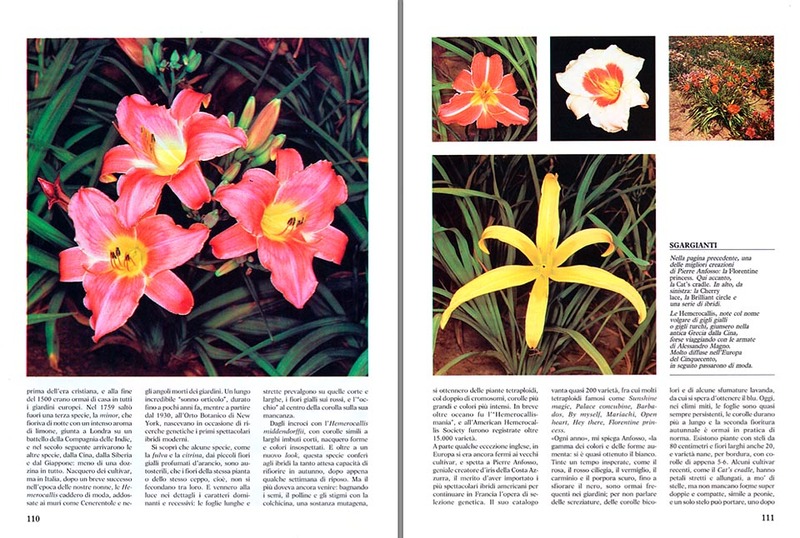 They discovered that some species, like the Hemerocallis fulva and the Hemerocallis citrina, with the small yellow flowers perfumed of orange, were self sterile, that the flowers of the same plant, or the same stock, that is, do not fecundate between themselves, and appeared, in details, the dominant and recessive characters: the long and thin leaves prevail on the short and wide ones, the yellow flowers on the red ones, and the “eye” at the centre of the corolla on its deficiency. From the cross breeding with the Hemerocallis middendorffii, corollas resembling to wide short funnels, appeared unexpected forms and colours. And, besides a new “look”, this species gave to the hybrids the so long awaited capacity to flower again in autumn, after just a few weeks of rest. But the most had still to come: moistening the seeds, the pollen and the stigmata, with the colchicine, a mutagen substance, they obtained tetraploid plants, with twice the chromosomes, bigger corollas and more intense colours. 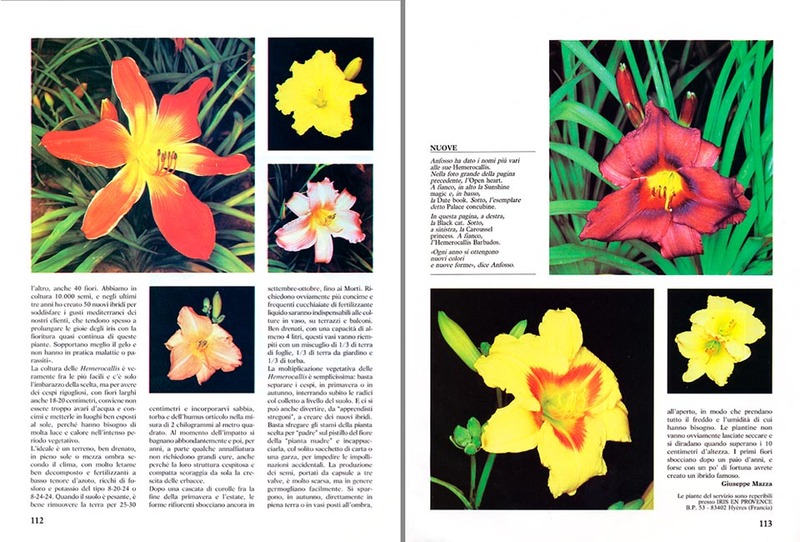 Shortly, overseas, came the “Hemerocallis-mania”, and more than 15.000 varieties were registered at the American Hemerocallis Society. Apart some English exceptions, in Europe they were still stationary with the old cultivars, and is due to Pierre Anfosso, brilliant creator of irises in the Côte d’Azur, the merit of having imported the most spectacular American hybrids for continuing, in France, the work of genetic selection. His catalogue displays almost 200 varieties, between which, many famous tetraploid plants, like the “Sunshine magic”, “Palace concubine”, “Barbados”, “By myself”, “Mariachi”, “Open heart”, “Hey there”, or “Florentine princess”. “Every year”, he explains to me, “the range of colours and forms increases: we have almost obtained the white, and dyes once unexpected, like the pink, the red cherry, the vermilion, the carmine, and the dark purple, almost skimming the black, are now frequent in the gardens; not to talk about the variegations, of the big corollas and some tones of lavender, from which they hope to get the blur. Nowadays, in the mild climates, the leaves are almost always persistent, the corollas last longer, and the second autumn flowering is now practically a rule. There are plants with stems of 80 cm and flowers even 20 cm wide, and dwarf varieties, for borders, with corollas of only 5-6 cm Some recent cultivars, like the “Cat’s cradle”, have petals thin and long, like stars, but there are forms super double and compact, similar to peonies, and a unique stem can carry, one after the other, even 40 flowers. We have in cultivation 10.000 seeds, and during the last three years, I have created 50 new hybrids to satisfy the Mediterranean tastes of our clients, who often are prone to prove the joys of the irises with an almost continuous flowering of these plants. They bear better the frost, and, in practice, do not have diseases or parasites. The cultivation of the Hemerocallis is very easy indeed, and there is only the embarrassment of the choice, but for getting luxuriant tufts, with flowers even 18-20 cm wide, it is better not to be too parsimonious with water and manuring, and to place them in well exposed locations, because they need a lot of light and warmth during the intense vegetative cycle. The best thing, is a soil well drained, in full sun, or mid shade, depending on the climate, rich of dung well decomposed and fertilizer with low contents of nitrogen, rich of phosphorus and potassium, of the type 8-20-24, or 8-24-24. When the soil is heavy, it is good practice to remove the earth for 25-30 cm, and incorporate same sand, peat and horticultural humus in the quantity of 2 kg per square metre. Upon installation, they must be abundantly watered, and then, for years, apart some watering, they do not require many attentions, also because their structure, tufty and compact, already discourages, by itself, the growth of weeds. After a cascade of corollas, between the end of spring and summer, the re-flowering forms blossoms again in September – October, till All Souls Day. Obviously, they require more manure, and frequent spoonfuls of liquid fertilizers will be indispensable for the plants in pot, on terraces and balconies. Well drained, with a capacity of at least 4 litres, the pots must be filled up with a mixture of 1/3 of leaves earth, 1/3 of garden earth, and 1/3 of peat. The vegetative multiplication of the Hemerocallis is very simple: it is sufficient to separate the tufts, in spring or autumn, interring immediately the roots with the collar at the level of the soil. And we can also have a good time, as “apprentice wizards”, in creating new hybrids. It suffices to rub the stamens of the plant chosen as “father”, on the pistil of the flower of the “plant mother”, and hood it, with the usual paper bag, or a gauze, thus avoiding accidental pollinations. The production of the seeds, carried by three-valves capsules, is very scarce, but, usually, they sprout easily. They must be spread, in autumn, directly on the soil, or in pots placed in the shade, in such a way that they can get all the cold and humidity they need. The small plants must not be, obviously, left drying, and when they overcome the 10 cm of height, they must be thinned out. The first flowers blossom after a couple of years, and maybe, with some luck, you will have created a famous hybrid. → To appreciate the biodiversity within XANTHORRHOEACEAE family please click here.